Stuck in town for spring break with the kids? Don’t worry! KPAC wants to offer youth classes and day camps over the March spring break. We are currently taking interest lists for dance, drama, and music. For more information, check out the interest poster below. Please be advised that for classes to run, there MUST be a minimum of 5 participants registered. To get your child on an interest list please call, email, or stop by the office. Registration for Rock Camp (Spring Edition) is available for registration now. 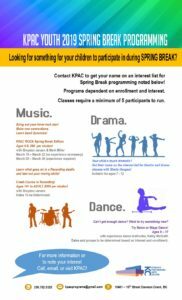 For any questions related to Rock Camp, please contact programs at kpacprograms@gmail.com or call the KPAC office 250.782.9325. « Drama is Back at KPAC!